Lots of excitement among geyser gazers—Morning Geyser is erupting! 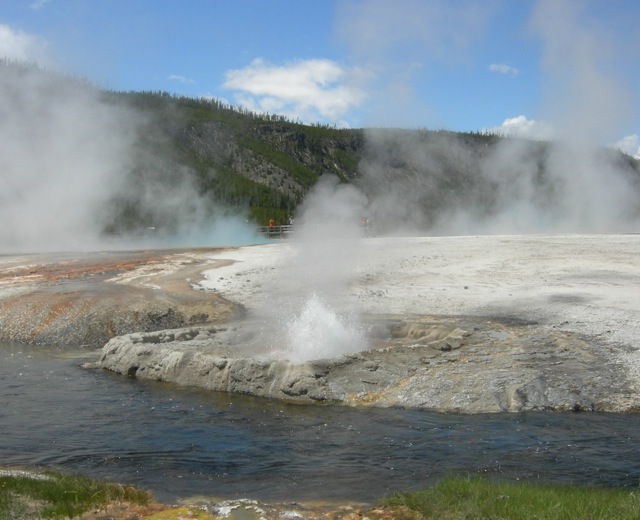 Comments Off on Lots of excitement among geyser gazers—Morning Geyser is erupting! Here is something I can only hope will keep happening until I arrive at Old Faithful on June 21st. Rare and phenomenal eruptions of Morning Geyser have been taking place quite frequently since March. Eruptions can go as high as 200 feet, and, best of all, it occasionally erupts in concert with its close but more frequent neighbor Fountain Geyser. 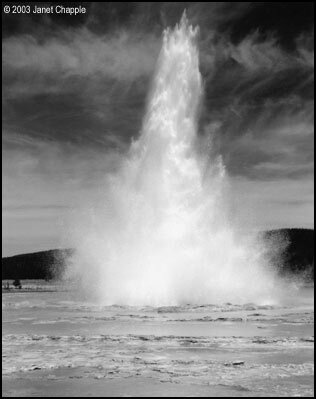 Check Geyser Times for the last known eruption of Fountain Geyser. Open that entry to find out the duration of that eruption. More than 40 minutes is more encouraging for a Morning Geyser eruption than less than 40 minutes. A period of 7.5-9.5 hours following the last eruption of Fountain Geyser becomes the forecasted window of opportunity. Arrive about 7 hours after the last eruption of Fountain Geyser and be prepared to wait a few hours. More information and Janet’s excellent pictures are at: http://www.yellowstonegate.com/2013/06/9th-known-dual-eruption-of-both-morning-fountain-geysers. “At Yellowstone,” he continued, “activity is clearly episodic. There was a very long period of volcanic activity between 170,000 years ago until about 70,000 years ago. Many tens of lava flows erupted during that time, though none were nearly as explosive as the supereruptions that are so oft-discussed in the press. 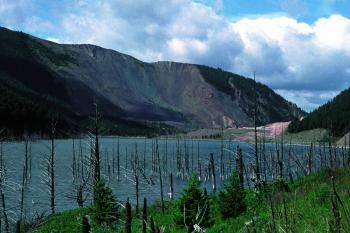 Since 70,000 years ago, there have been no volcanic eruptions at Yellowstone. Nearly all geologists I know expect that Yellowstone will experience future volcanic eruptions, but we honestly cannot state when they will occur, nor do we know if there are any more supereruptions in Yellowstone’s future. You can read more at: http://www.msnbc.msn.com/id/43329798/ns/technology_and_science-science. I’ll be wearing my Supervolcano T-shirt in the park, starting June 20th . . .
Supervolcano: are we ready for another caldera explosion? Comments Off on Supervolcano: are we ready for another caldera explosion? As I pack for my annual trip to Yellowstone, people ask me if I worry about the escaped Arizona criminals being in the area or the potential eruption of the so-called supervolcano. My answer is no to both, since the chance of running into the criminals is probably less than that of being struck by lightning, and the caldera eruption will give us ample warning, now that the equipment and organization of the Yellowstone Volcano Observatory team is in place. Predicted in our interview with Yellowstone Treasures’s geologist is the putting in place of a scientific team and equipment to detect any changes in underground activity that will precede the next caldera eruption. You can download a USGS paper detailing the mechanisms for detecting and warning the public about “episodes of unusual geological unrest at the Yellowstone Caldera” at: http://pubs.usgs.gov/circ/1351. This sets up an Incident Command System, explains how the various personnel and agencies will be structured and will react with each other in the case of impending danger, and how the public will be kept informed. It also outlines specific scenarios for reaction to catastrophic events. As for me, I won’t be writing blogs in the next while but will be enjoying favorite places and friends in and around Yellowstone. There’s not much snow yet [in December 2009], but the southern part of the park could get three to six inches this weekend, and visitors who want to enter on snowcoaches or snowmobiles on opening day, December 15th, may be in luck. Or they may have to go the only way allowed, if there’s not enough snow——by commercial wheeled vehicle, that is, buses. You can check out what Old Faithful looks like in daylight hours at the Old Faithful Webcam and judge for yourself whether the snow is getting deep by checking out whether or not the viewing benches are covered. Then starting Tuesday, the predicted time of the geyser’s next eruption will be posted. The new and improved ice rink will make the process of making and maintaining a smoother surface easier and more efficient by keeping the water in place while freezing. In years past, the ground would have to be completely frozen and then saturated with a fine mist, a process that could take weeks to accomplish. This year, the ice rink was erected and flooded in two days.